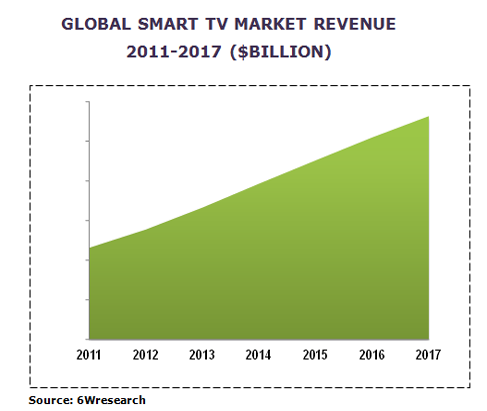 The Global TV market has experienced significant changes in its market landscape due to the consumer's demand for multi-functional services, provider's opportunity for new revenue, the advent of digital TV, and the broadband internet. The global TV market has reached the fourth generation of connected TVs where all major manufacturers are debuting new models with innovations in content aggregation, apps development, and user interfaces. The success of smart TV depends on applications dynamic, user interface technology and a high-performance platform instead of the screen technology. According to 6Wresearch, the Global smart TV market is expected to reach $281.8 billion by 2017, growing at a CAGR of 15.2% during the period 2012-2017. The report thoroughly covers the smart TV market by shipments, and by region. The report provides the unbiased and detailed analysis of the on-going trends, opportunities/high growth areas, market drivers which will help the stakeholders to device and align their market strategies according to the current and future market dynamics. o North America: U.S., Canada and others. o Western Europe: Germany, U.K., France, Italy and others. o Asia Pacific: China, Japan and others. o RoW: Middle-East, Africa and Latin America. Though, Global Smart TV market is still in the nascent stage, but with the growing demand for LED TVs, rising internet population worldwide, increasing consumer spending on consumer electronics, etc., the market is expected to gain significant momentum in the coming years. According to 6Wresearch, Global smart TV market is expected to reach $281.8 billion by 2017, growing at a CAGR of 15.2% from 2012-2017.